...a wildly off-beat comedy about a male dancer (Paul Mercurio) who refuses to follow the accepted rules of ballroom dancing and creates his own style of choreography, which infuriates the ballroom dancing establishment. Before he's scheduled to compete in the Pan-Pacific ballroom championships, he's forced to take up a new partner (Tara Morice), a beginner who initially seems without promise. Strictly Ballroom: Special Edition - On November 23, 2010 the most captivating, hilarious and exaggerated romantic comedy about the fantastical world of ballroom dancing and the fixated characters that live within it, Strictly Ballroom , makes its highly-anticipated debut as an all-new Special Edition DVD. Released by Walt Disney Studios Home Entertainment and co-written/directed by awardwinning Baz Luhrmann (best known for The Red Curtain Trilogy, which includes his films Strictly Ballroom , William Shakespeare's Romeo + Juliet and Moulin Rouge), Strictly Ballroom is a wildly off-beat comedy about a male dancer (Paul Mercurio) who refuses to follow the accepted rules of ballroom dancing and creates his own style of choreography, which infuriates the ballroom dancing establishment. Before he's scheduled to compete in the Pan-Pacific ballroom championships, he's forced to take up a new partner (Tara Morice), a beginner who initially seems without promise. 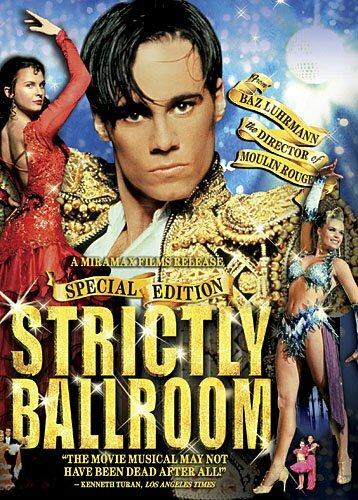 Strictly Ballroom: Special Edition DVD will retail in the US for the suggested retail price of $19.99 and include a four all-new, never-before released extended bonus features – a mini documentary and audio commentary featuring Baz Luhrmann and the journey of creating the film, interviews with real ballroom dancers and competitions and an insightful 3D gallery of images that explain the inspiration behind the film, costumes, characters, etc. When released theatrically in 1992, Strictly Ballroom quickly emerged as an award-winning audience favorite – it garnered at the Cannes Film Festival's Prix de Jeunesse ("Award of the Youth – Foreign Film") in 1992, The Toronto Film Festival's "People's Choice Award" in 1992, a Golden Globe nomination for "Best Picture – Comedy/Musical" (1994), 12 Australian film academy awards including best picture, and many, many more.